One of the most potentially impactful cannabis reform bills introduced in the last Congress was the Veterans Medical Marijuana Safe Harbor Act, sponsored by Senator Brian Schatz (D-HI) and former Senator Bill Nelson (D-FL). Yesterday, Senator Schatz was joined by Cannabis Caucus Co-chair Representative Barbara Lee (D-CA) in reintroducing this legislation in the Senate and the House of Representatives. 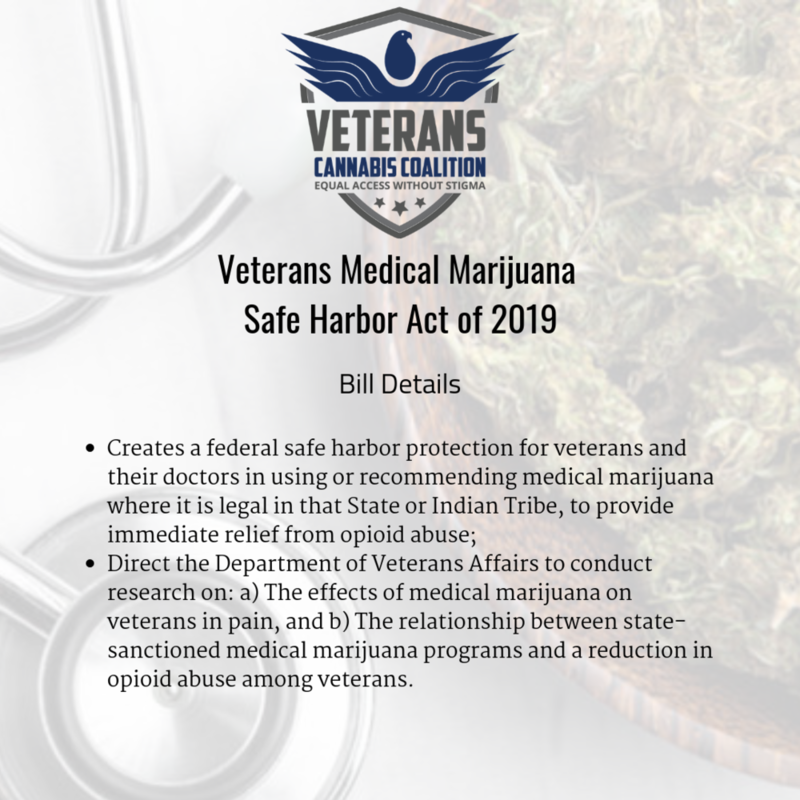 In addition to funding medical cannabis research in the Department of Veterans Affairs, the bill would provide ‘safe harbor’ to veterans who use, possess, or transport ‘medical marijuana’—in accordance with their state laws—from federal prosecution under the Controlled Substances Act. This would effectively federally legalize cannabis possession for veterans. The bill also includes the Veterans Equal Access provision which would allow VA doctors to discuss and recommend medical cannabis in-line with state law where they are practicing. Both Republican and Democratic lawmakers in the House of Representatives and the Senate have been attempting for years to get that specific language into the US code—it’s been filed separately as part of the CARERS Act in this Congress as well. At first glance, it might seem unfair to single out veterans for an exception to federal cannabis laws. But being a ‘veteran’ is a legal status that comes with both benefits and drawbacks when it comes to being able to lawfully use cannabis—while their home state may have legalized cannabis or made exception for medical use, millions of veterans use the Department of Veterans Affairs (VA) as their primary healthcare provider. The VA, as a bureaucratic institution driven often by political agendas, has been hostile to cannabis for decades. As recently as last year former Secretary of the Department of Veterans Affairs, David Shulkin, sent an error-riddled letter to the House Veterans Affairs Committee claiming the VA could not legally study cannabis. This is, and always has been, false. The Drug Enforcement Administration (DEA) may issue special licenses to researchers to investigate Schedule I substances, cannabis included, and the National Institute on Drug Abuse (NIDA) may approve shipments of government-grown cannabis to licensees. It is a long, frustrating, and expensive process, but it is possible. Since so many administrators and physicians within the VA are either ignorant or prejudiced about the benefits and risks of cannabis, most veterans either end up avoiding talking to their doctor about their cannabis use or get classified as having a cannabis use disorder (CUD). While the VA cannot strip benefits from veterans with CUD, doctors are authorized to modify their treatment plans. This includes changing a veteran’s prescription medications—VA doctors have forcefully tapered veterans off opioids and other pharmaceuticals because of their cannabis use. While opioids will always have significant risk when prescribed, they can be extremely effective when properly employed. Furthermore, we must recognize that the pain management effectiveness of cannabis does not apply to all types of pain—neuropathic and post-surgical pain are extremely difficult to control, for example. All this is to say that veterans are often caught in deadly catch-22. We have met hundreds of veterans, personally, who credit cannabis with saving their lives. Yet by exercising their right to self-care and using a low-risk/high-benefit, but federally illegal, substance like cannabis they risk everything: their job, their 2 nd Amendment privileges, custody of their child, and their freedom. If they abide by the care plans set out by the VA, then they are saddled with potentially a dozen plus medications that carry serious side-affects and long-term harms. The same veterans that see cannabis as a life-saver point to the ‘combat cocktail’ of opioids, sedatives, stimulants, and anti- psychotic/anxiety/depression drugs as the primary driver in nearly fatally overdosing or taking their own lives. Either way, veterans suffer. As of this article, 6,985 servicemembers have been killed in the last nearly 18 years of fighting in Iraq and Afghanistan. By the VA’s own numbers, somewhere between 18-22 veterans and servicemembers commit suicide daily. That comes out to over 100,000 suicides in the same time span. The Veterans Health Administration (VHA), the largest component of the VA, is the biggest unified healthcare provider in the country with nearly 300,000 employees and a $65 billion budget. The federal government has an explicit legal and moral obligation to care for veterans to the best of their abilities. They cannot fulfill that obligation so long as cannabis is federally prohibited. Cannabis is the way, veterans are the means, and legalization is the end. But we know legalization alone does not undo the damage that the last 80 years of anti-science and anti-human decisions and behavior. As we approach the end of this nearly century-long injustice, we can see the pitfalls of placing profit before patients, investors before the environment. It rests with us as citizens to come together then to end prohibition in a way that serves all Americans, reform cannabis laws across the country, and restore the rights of those who have been injured by the Drug War.